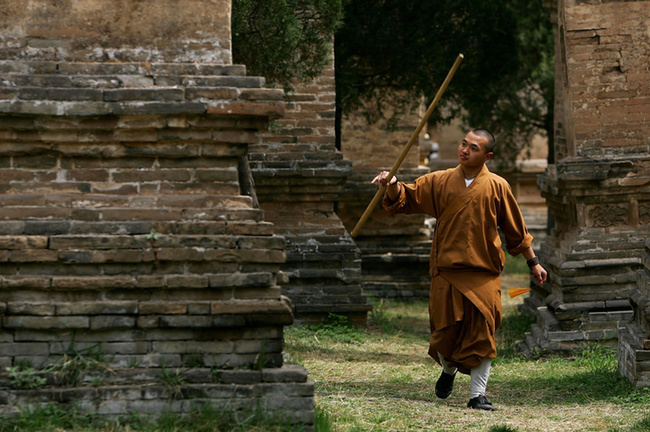 The wild Buddhist monks who made up the first monastic armies of the medieval era were known for their staff fighting. Clerical warriors seem to be drawn to the staff, no matter which culture, and for Buddhists there is something of an explanation. The original “18 items” a Buddhist monk can possess include a begging bowl and a ringed staff. The staff had metal rings attached to one end and for people of the medieval era, the rhythmic sound of the staff and the jangling rings became associated with begging monks and the Buddhist faith in general. Poets wrote of escaping from the dreary realities of daily life via the ringed staff, they wrote of the sound of the staff on stone during the winter, and artists drew monks and Buddhist saints holding staffs. The staff was an inseparable part of the monk and the deities your average Shaolin monk would prostrate himself to. Vajrapani, the tamed demon who guarded the gates to the Buddha’s inner sanctum, held a scepter for many centuries until Shaolin monks changed the scepter to a staff to reflect their own legends and martial traditions. “Someone may ask: As to the staff the Shaolin [method] is admired. Today there are many Shaolin monks who practice hand combat, and do not practice staff. Why is that? A legendary depiction of the Buddhist deity Vajrapani saving the Shaolin Temple from bandits. The staff would remain the standard weapon for monks serving in small armies, but during the Ming and Qing dynasties they began training in unarmed hand to hand combat. Once the monks started training their kicks and strikes, martial artists across China followed suit. For one, as the technical expertise of the average foot soldier became an issue, generals and military strategists looked to tweak as much as they could to get an edge. With specialized troops such as staff wielding monks, or stone throwing miners, or axe-wielding northmen taking the field alongside Imperial conscripts, it just came natural to cross train and tinker around. Qi Jiguang, who we’ve talked about before, prized unarmed combat specifically for its usefulness in training the average soldier. Strategists basically wrote that mastering unarmed combat was step one, mastering the staff step two, and after that mastering swords and spears would come easily. Kung fu was the building block of the new man at arms. 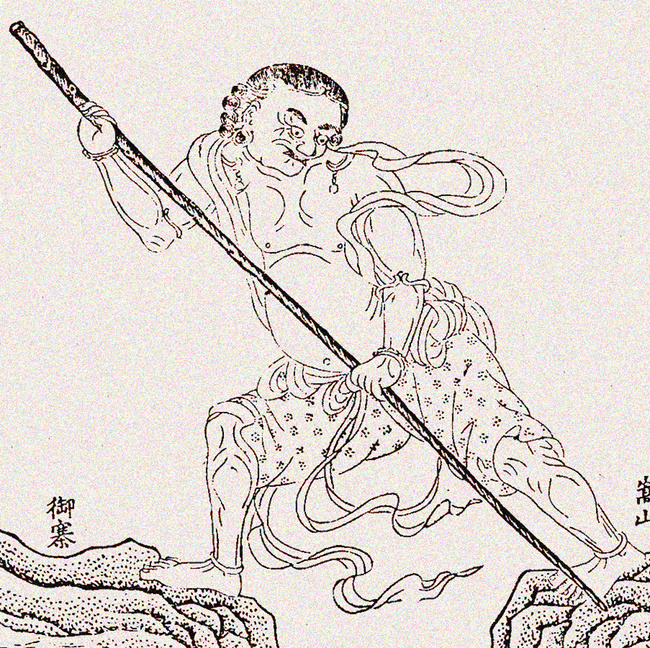 Zongyou’s reason above makes sense too: after mastering the staff, martial monks started branching out. Instead of taking up swords and axes—although monks did from time to time—it seemed the majority of the warrior monks focused on unarmed combat. Religion may have played a role, preventing monks from moving into wholesale armed combat. Another reason is the overall change in living conditions. Life in 15th century China wasn’t easy for the average guy, but it was much easier than 7th century life. There was a certain level of civilization that citizens could expect. Peace wasn’t unheard of, and in times of peace unarmed combat made more sense than training with the sword. Literati and sages took up martial training in the hopes of attaining enlightenment; it’s no coincidence that the predecessors of the internal martial arts, taiji, and other unarmed styles all exploded during this period. Martial arts was more than just a soldierly duty, it was a path for self-cultivation. This civilizing trend also produced more art and literature for more people than ever before. Instead of elite scribes putting together tomes for the Emperor and his friends, people who failed the Imperial examination took to travel writing, or poetry, or proto-journalism. Manuals for the common people exploded. Everything from how to cook to how to dress to what to plant when. Literacy was no longer the privilege of the rich. At the same time, new publishing and distribution technology made all of this new writing available to many more people. Legends were born. Reputations made. People started talking about fighting styles and comparing one to another. What could have been an isolated band of kung fu monks in the mountains became a social phenomenon, spawning style after style, influencing the entire martial tradition for centuries to come. The Shaolin Temple and all of the various kung fu styles out there had a symbiotic relationship. Styles could claim to have been created or refined at the temple, and the temple could start branding itself as the source of all kung fu. Everyone benefited. To go out on a limb and say you had nothing to do with the Shaolin martial art would probably be bad for business. Hence the many wild legends out there at the heart of many dojos. Shahar and most other martial arts historians believe the martial art Chen Wangting taught in the waning years of his life is the direct ancestor of what we know today as Taiji Quan. Not sure if all of the taiji people feel that the 1630s is ancient enough, but the historical record tells us that the 17th century is when unarmed combat really came into vogue. Throughout central China, monks and bandits honed their unarmed techniques, while Ming era strategists and poets took what they thought was useful, or beautiful, and used it or immortalized it in verse. Another two centuries later, and we have the late Qing and early Republican period. The early 20th century were the days of of Huo Yuanjia and later Ip Man, the direct descendants of the first identifiable kung fu masters as we think of them today.